Make a career switch, advance in your current role, or start a new business venture. Wherever you're headed, the Jones MBA Career Center helps you get there. Our mission is to prepare students for their job search and recruit companies to hire Full-time MBA students for summer internships and permanent employment. We offer a variety of services to enhance your personal growth and job search skills. Develop a career strategy, identify job search targets, and explore MBA career options. Prepare for the interview process and MBA job market. Identify MBA recruitment opportunities for both summer internship and permanent employment. Full-time MBAs benefit from the personal attention of the program including a 27:1 student to advisor ratio. You will be assigned to a corporate relations manager who will advise you throughout the two-year program. Your advisor will get to know you personally, and help you develop an MBA career placement strategy to leverage your individual strengths. Our career center staff has years of professional experience and understands industry dynamics. Because our corporate relations managers advise students and also manage relationships with companies' MBA recruitment teams, they know the skills recruiters are looking for and how to help you prepare for the MBA job market with MBA career options. Planning your career path is a process of continual discovery. We provide a variety of resources to help you position your skills for paid summer internships and permanent employment. You'll learn job search skills that you'll use throughout your career. MBA Business Buzz: A special portal only accessible to Georgia Tech MBAs, where students can post resumes, gather information about job/internship opportunities, apply for jobs and internships, and register for information sessions and other recruiting events. Resume Books: Resumes of graduating MBA students seeking full-time employment and first-year students seeking internships are made available to companies that choose to recruit remotely. Career Leader: A career self-assessment tool, used by more than 260 top business schools and corporations worldwide to identify student career interests with sample MBA jobs, areas of strength, and helpful information on organizational fit. Optimal Interview System: A video-based interview preparation system allowing you to customize practice sessions and record responses to critique your performance. Practice Interviews: Interview with and receive immediate feedback from career services professionals from our team. In addition to college recruiting expertise, Georgia Tech's MBA Career Services team has a wide range of corporate experience. Our MBA career development team members have served in various career development, human resources, and management roles at industry-leading companies. We consistently rank a top 10 MBA program in the nation for MBA career placement as a result of the hard work of our MBAs on their job search combined with the corporate experience of our career services staff. Kelley Broome joined the MBA Career Services team in April 2013. Her past experiences include 14 years of recruiting for university admissions and study abroad programs. Most recently she worked with graduate programs and admissions for Scheller College of Business. Kelley communicates with recruiting companies, executives, and students on MBA processes and procedures. She also manages the corporate job database and organizes information sessions, resume drops, MBA Career Services events, and on-campus interviews. She received her M.S. in College Student Personnel from the University of Tennessee, Knoxville. Larry Faskowitz joined the MBA Career Services staff in January, 2018 and brings over 30 years of management and industry experience to our students and the companies that he worked with to this role. Larry is responsible for providing career coaching to MBA students and managing the relationships for a portfolio of companies seeking to recruit MBAs. He's had a distinguished career as a senior executive at Kodak with responsibility for some of Kodak's largest customers and managing teams that had MBAs on them. More recently Larry has served as an executive coach and recruiter. He is passionate about developing others. Larry received his B.S. in Marketing from Syracuse University. Caroline Player joined the MBA Career Services team in February 2016 after working in alumni career services at the Georgia Tech Alumni Association for nine years. She has also advised business and engineering students at the University of South Carolina Career Center. Caroline provides career coaching to the working professionals in the Evening MBA program as well as growing and maintaining relationships with employers that hire MBA students. Caroline has an undergraduate degree in Accounting and Business Administration: Finance. She also has a M.Ed. degree in Student Personnel Services from the University of South Carolina. Lauren Porter joined the MBA Career Services team in July 2017 from AT&T in Dallas where she participated in the leadership development program after graduating with an MBA from the Terry College of Business at the University of Georgia. She completed rotations as a network services manager, a benefits manager, as well as a learning and development consultant. Lauren had eight years of business experience prior to her MBA, and her undergraduate degree is marketing from the University of Richmond. Kristen Pratt joined Georgia Tech in 2017. After she graduated from Cornell, she spent three years with Procter & Gamble in the strategic sourcing area. Kristen then attended The Wharton School for her MBA. Upon graduation, she joined Bain & Company as a consultant in Atlanta for two years. After time with Turner Broadcasting as senior director of strategic planning, Kristen returned to Bain as director of consulting operations and human resources for eight years. Kevin Stacia joined the MBA Career Services staff in February 2013, after having worked in Georgia Tech Career Services for three years as a Career Specialist. Prior to joining Georgia Tech, he worked for 20 years as a Human Resources professional with several high tech companies including Scientific Atlanta, HP, and Agilent Technologies. During his tenure at Agilent Technologies, Kevin served as the Global Campus Program Manager for their Life Sciences business unit. He received his MBA from Clark Atlanta University. Kevin is responsible for providing career coaching to MBA students and managing the relationships for a portfolio of companies seeking to recruit MBAs. Proof is in the placement and Georgia Tech graduates enjoy tremendous success. 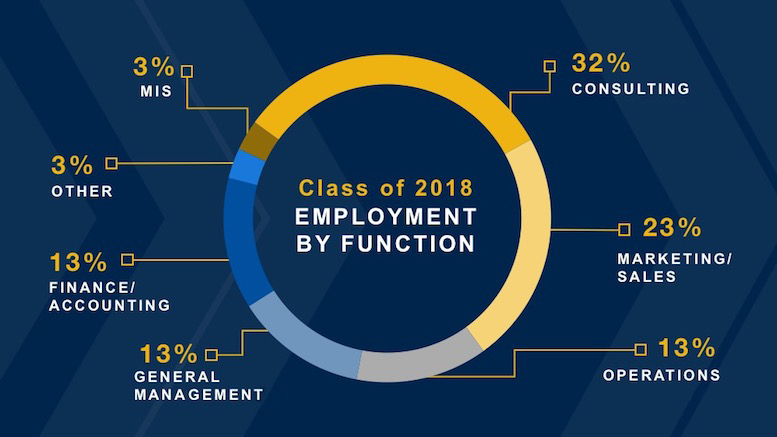 Our MBAs continuously achieve some of the highest job placement figures in the country for permanent positions and paid internships for first-year MBAs. Georgia Tech's MBA students are strong and successful competitors in regional and national job markets. Our students are recruited by firms from a broad range of industries for positions that offer opportunities for professional and personal growth and advancement. 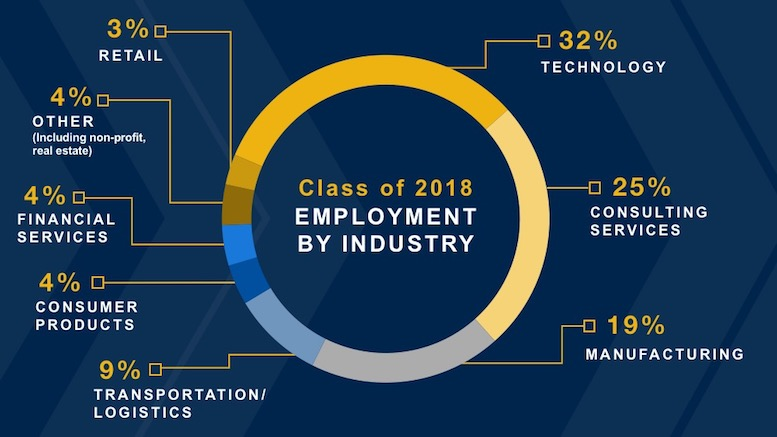 More than 100 companies recruit Georgia Tech MBA students through the Jones MBA Career Center each year, representing functional areas such as leadership development, strategic and functional consulting, operations and supply chain, technology, business analytics, corporate finance, and marketing. The MBA Career Center was one of the biggest reasons why I chose Georgia Tech for my MBA! The one-on-one attention you receive in your career search is something you won't get in most other MBA programs.